In Sarah Manguso’s romance with concision, she nearly writes off writing. Manguso’s conception of her writing as both infinitesimal and infinitely important is the driving force behind her new book, 300 Arguments. It’s a collection of aphorisms, which range in length from one sentence to almost a page. Some read like maxims, some like brief personal essays. At their best they are pithy and wry, with a melancholy undercurrent that takes a beat to set in—like a vaccine whose pinch gives rise to a muscular ache. “There truly are two kinds of people: you and everyone else,” is one. ‘300 Arguments’ circumvents conventional narrative as such; it also withholds the comfort that it can provide. In large part, 300 Arguments is a treatment of longing and disappointment. Throughout the book, Manguso is preoccupied with romantic love and creative ambition, and portrays them as hungers that can’t be sated. Of sexual desire, she writes: “There were people I wanted so much before I had them that the entire experience of having them was grief for my old hunger.” And of professional aspirations: “The trouble with setting goals is that you’re constantly working toward what you used to want.” Desire yields dissatisfaction, whether its object is gained or not. Many of the aphorisms are about writing, which she regards both deferentially and dismissively. On the one hand, she describes the “page of perfect prose I read in a dream” and says, self-referentially, “the smallest and shortest pieces of art strive for perfection.” It is clear from her compressed style that she believes in the absolute value and transcendent power of a good sentence. Yet, at the same time, she writes that “Details aren’t automatically interesting” and “You might as well start by confessing your greatest shame. Anything else would be just exposition.” In her romance with concision, she nearly writes off writing. 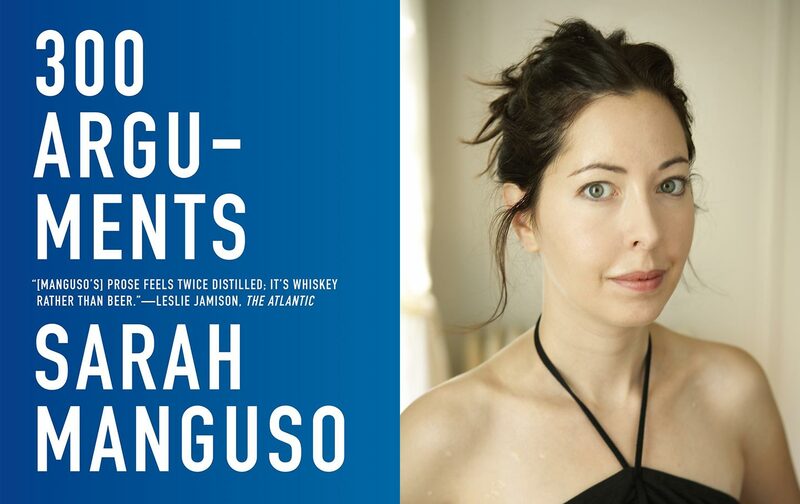 Manguso calls 300 Arguments “a short book composed entirely of what I hoped would be a long book’s quotable passages.” Some of those books are her own. The line “I love the doctors who act unimpressed, as if everyone has to contend with this,” draws from Two Kinds of Decay, but it has much less impact without the context: the hematologist saying, “Look, here is the smallest violinist in the world playing you a Dvořák violin concerto” as she expresses her fear of death. Or how, when he told a girl with leukemia to go swim in the ocean one last time and the water got into her catheter—“the thickness of a piece of angel hair pasta”—and infected her blood, “he smiled the way we do when we talk about naughty affairs.” The line in 300 Arguments is simple and elegantly phrased, but it has lost its vivid immediacy. By bouncing from ghost to unrelated ghost, Manguso creates a world, but not one that her readers can inhabit. While her previous books also used episodic, sometimes disjointed structures, Manguso seemed to write this way out of a desperate need to express something that was too big to fit her arms around. And it worked, to dizzyingly good effect. In 300 Arguments, however, she says, “I used to write these while playing hooky on what I hoped would be my magnum opus. Assigning myself to write three hundred of them was like forcing myself to chain-smoke until I puked, but it didn’t work. I didn’t puke.” And it comes through—that, on some level, these aphorisms are a clever game or an experiment. Then again, perhaps this sense of the form’s insufficiency is a product of Manguso’s lofty emotional goals. Given her desire to make readers “choose life,” her subjects are relentlessly heavy: disease, grief, disappointment, and the ephemerality of human existence. Manguso’s cures for despair sound a lot like its causes. Maybe her intent is akin to what my psychologist friend once told me: If you ever encounter someone on a ledge, you shouldn’t tell them how much they have to live for, but rather that their feeling of hopelessness is justified. Maybe it’s only the sharing of despair that brings relief. With each book, the pain that Manguso addressed has become increasingly universal. First was her rare disease, then her grief after the loss of a friend, then the passage of time, and now, with 300 Arguments, the unfulfillable nature of desire. She has gradually widened her lens more and more, until her object of focus became the Buddhist vision of life as suffering, with desire as the cause. T he pain she’s examining is “the human condition.” As she writes in one aphorism: “I wish I’d known at twenty-one, when I developed a chronic illness and became suddenly alienated from all my peers, that over the decades, one by one, all of them would come join me on my island.” Maybe the only consolation that Manguso can offer, as a serious writer in a vast, chaotic universe, is that we are on it together. Michele MosesMichele Moses is a member of the editorial staff of The New Yorker.